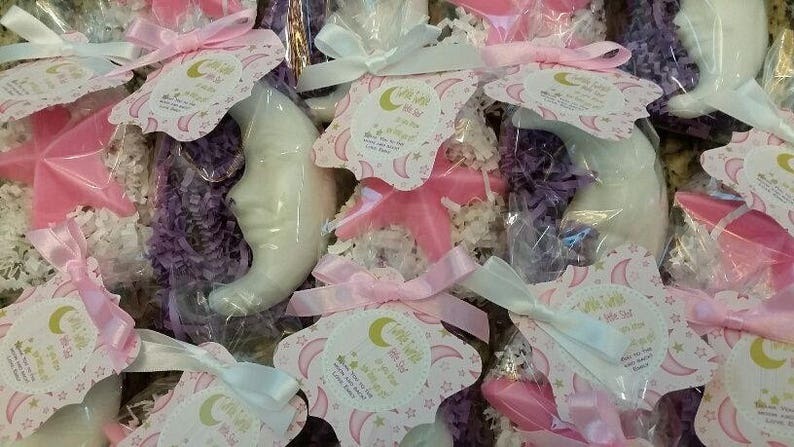 This listing is for 10 Soap Favors with customized tags perfect for your Twinkle Twinkle Little Star themed baby showers, baby sip and see announcement favors or Baby's First Birthday! 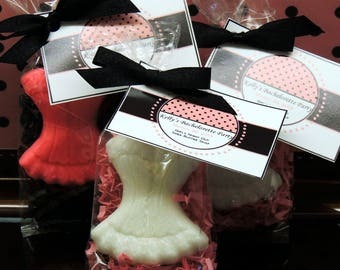 You will receive 5 Moon Soap Favors and 5 Star Soap Favors in your choice of two colors and scents. Moon soap measures apx 4" tall and Star soap measures apx. 3" tall. 2) SOAP COLOR(S): Choose two colors for your set of 10 favors- we can make these in just about any color combinations you would like. ***We schedule all orders for production by party date typically apx 14 days before your event date unless an earlier ship date is requested prior to purchasing. If you would like an earlier ship date, indicate the date you would like delivery by in the notes to seller at checkout. We still require 5-7 business days production time for all orders. Orders ship via USPS Prioirty Mail (2-3 day delivery time) no later than the Monday before your weekend party for delivery by Wednesday before your weekend party. Tracking information will be e-mailed to your ETSYl e-mail address when your order ships. ****Please be sure to type all custom information required in the NOTES TO SELLER AT CHECK-OUT***. We will not schedule your order for production until all custom specifics are provided. If we need to contact you, we will do so by sending a convo to your etsy e-mail address.